I like the Raspberry Pi idea, I have given some thought to that as well. They are a router, and they have a USB port and you can install your own Linux, so they can also function as a light-duty server. That way you only need space and power for one device instead of two. 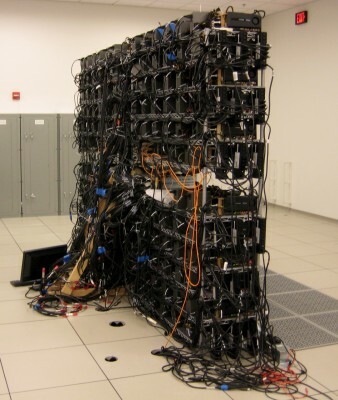 Or, you can compromise and rent a virtual server, e.g. $20/month; possibly cheaper and less hassle on an amortized basis. That way you control all the software, but not the hardware. If I was going to provide world-facing services, I’d definitely want to go with a rented server (physical or virtual) with a high bandwidth connection. If I’m just providing services to friends and family, running something out of my house would be worth considering. One service I forgot to mention is a backup service. For that you’d definitely want to be located somewhere else than the same building with your computer. I currently just use Apple’s Time Machine. It’s very convenient and works great, but my disk is sitting about two inches from my desktop machine—much too vulnerable to a common disaster. I sync to a USB drive regularly at home, and every few months sync to a second drive that I keep at my office. I’m planning to leave a third at my parents’ house in another state next time I visit, in case of a huge natural disaster. The amortized cost of DIY backups is still less than services IMO. I heavily rely on Google Apps for email. Now I’m not sure if I can trust my data to the makers of Google Reader. I’d like to host my own account but I’m considering other options as well (Outlook or FastMail). I skipped Drive, I’m a happy Dropbox user. Dropbox keeps “my” data secure. I don’t really buy into the “free versus paid” debate. Free products, paid products, doesn’t matter as long as they work. When I signed up for the service, Google Reader was free AND no better alternative existed. I also switched from Delicious to Pinboard. I paid a small, one-time fee and didn’t regret it.